Can HP Attract App Developers To A webOS Tablet? 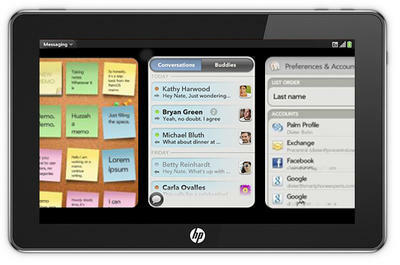 HP spent $1.2 billion to acquire Palm, the company behind the webOS software that powered the Palm Pre and Palm Pixi. While the phones never really caught on, the one thing people said they loved about them was the operating system (OS). Unfortunately, another factor of the downfall of the webOS devices was the lack of support by developers who were pouring all of their love into the iPhone OS as it was known at the time. Now we stand at a crossroads where a new company controls the software, entirely new devices and formats will be coming with the beloved webOS, but the question remains: Will things go any differently this time with the developers? The issue here is not if the webOS is any good, but developers have limited time and resources to put into apps on multiple platforms. A bit of a Catch-22 now exists in the world of development: Consumers want lots of apps before they buy a product, and developers want lots of consumers before they build the apps. It has become a bit of a game of chicken where you have to wonder which side is going to blink first and swerve the car into a possible heaping mound of cash. The whole point is that webOS tablets are going to have to compete with some very heavy hitting competition to get the attention of the developers. At this point in time, you have the iOS which has proven itself beyond a shadow of a doubt to be a winner, but with well over 200,000 apps in the store now, developers are struggling to stand out amongst the garbage. Google's Android Market has somewhere around 70,000 apps at this time, and has been on a major upswing as of late due to the number of Android devices shipping on a seemingly daily basis. Microsoft so desperately wants to make sure the Windows Phone 7 is a hit that it is rumored to be paying up-front money to some developers to get them to build apps on the soon-to-be-released platform. Don't forget that there is also going to be Chrome OS tablets at some point in the not too distant future courtesy of Google. Developers are being courted from every side right now, and while it's a good place for them to be, it could be the death of new products that can't get their attention. Even though there is a new sheriff in town when it comes to who owns webOS, it doesn't change the fact that this is the second time out of the gate for this system, and you can't blame developers if they might be a tad bit leery of putting their eggs into the metaphorical basket. Personally, I think webOS should be given a chance to prove itself, but then I'm not a developer trying to make their living from building apps. I would love to see this new tablet succeed as I think competition for the iPad is a good thing, but it's going to be a bit before we see if developers are willing to pull themselves away from proven money makers to build for the new kid on the block. What say you? Could a webOS tablet succeed without enough apps at launch?